Our second semifinal in Bracket Five of the Fantastic Reviews Battle of the Books features Nightglass by Liane Merciel against The Testament of Jessie Lamb by Jane Rogers. The book I (Aaron) most want to continue reading after 100 pages will reach the championship round. 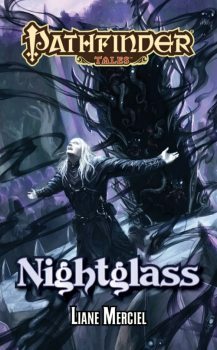 Nightglass: Paizo paperback, July 2012, 345 pages, cover art by Tyler Walpole. Nightglass reached the Final Four by defeating Paradox Resolution by K.A. Bedford in the first round and The Devil's Nebula by Eric Brown in the second round. Nightglass is a tie-in to the Pathfinder role-playing game. "Shadowcallers" control the unpleasant region of Nidal. Our young protagonist Isiem, identified by the shadowcallers as having magical abilities, has begun training against his will in the shadowcallers' dark form of sorcery. This training includes requiring Isiem and his fellow students to practice torture on slaves, on each other, and even on the shadowcallers themselves. Those unable to master the magical techniques face dire consequences. Isiem is among the most talented of the new recruits, but he is beginning to realize that may be an even greater curse. The Testament of Jessie Lamb: Harper Perennial trade paperback, May 2012, 240 pages, cover photo by Clayton Bastiani. The Testament of Jessie Lamb advanced to the Final Four with wins over This Case is Gonna Kill Me by Phillipa Bornikova in the first round and A Guile of Dragons by James Enge in the second round. 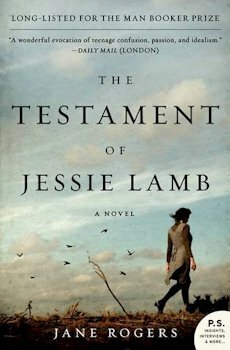 The Testament of Jessie Lamb is the memoir of Jessie Lamb, imprisoned by her father for reasons she has not yet revealed, although they are becoming pretty obvious by the end of 100 pages. Jessie lives in a near-future world where the MDS virus has made it fatal for any woman to become pregnant. Jessie has flirted with various protest groups, whose youthful idealism contrasts with her father's cynicism. Jessie's father is a scientist, and from him we discover that doctors have learned to induce comas to allow pregancies to come to term, although the "Sleeping Beauty" mothers will never wake. They have also developed a vaccine that can be used on embryos frozen before the spread of MDS (and thus not already infected) to make the motherless children immune to the MDS virus. The Battle: Here are two very well-written books with interesting stories, but between pages 50 to 100 both authors have introduced unpleasant story elements, which make it a challenge for them to keep their readers engaged. Was it wrong to torture a helpless slave, if serving as their practice subject was all that kept that slave alive? Was it still wrong if he inflicted the same pains on his closest friends, and suffered them in turn? Not eagerly——not because he was able to take any pleasure in it, as more devout Kuthites seemed to——but because he, too, survived only by the lash? If it was not wrong, was it right? Isiem didn't know. He was increasingly unsure whether he cared. Questions of that sort seemed relics from another world . . . They were things that existed in books, and they had no place in shadow-swathed Pangolais. Isiem will soon participate in a ceremony of torture, in which one of his classmates plans revenge against a despised teacher. The teacher richly deserves what is coming, and Isiem will be at a loss whether to help the other student or try to save the teacher. I admire Merciel's ability to show Isiem falling into evil even as he remains a mostly sympathetic character. That said, I don't much enjoy reading extended descriptions of torture, and since I don't have a clear concept of where the story is headed——one suspects eventually Isiem will rebel, but there is no hint of that yet after 100 pages——it's difficult to feel enthusiastic about continuing. The story of The Testament of Jessie Lamb has taken some similarly distasteful turns, including a scene in which Jessie suffers physical abuse from her father and a flashback to when Jessie was assaulted and a close friend raped. But somehow these scenes have been less offputting than the torture and oppression in Nightglass, perhaps because I have a stronger sense how this brutality is advancing a larger, important story. I knew Dad and I were both thinking about those frozen embryos which can be put in a surrogate mother and vaccinated against MDS. It's exactly the same thing. It gives us a chance of survival. And quite suddenly it struck me how amazingly clever that was. I was thinking about the extraordinariness of the way sea horses must have evolved over thousands of years, and then about how humans know so much that within a space of days they can use their brains to choose to incubate their babies in a different way. The shining sea horses hung like question marks in the water, staring at me with their sideways eyes. I remember staring back at them and realising that human beings are beautiful and clever and ingenious. I suspect Jessie's father is soon to have a reverse realization, that what he viewed as a hopeful development for society carries terrible implications for his family that will cause father and daughter to become violently opposed. The Testament of Jessie Lamb mostly focuses on the small scale, on Jessie and her family and closest friends. But Jane Rogers is telling a big story, about what happens to all of society when it loses hope in the future. This is what science fiction is for, and I very much want to see where Rogers is taking this tale. The Testament of Jessie Lamb advances to the championship round, where it will face Harmony by Keith Brooke.